A few days ago, I wrote about our Thankful Tree. Although we try to teach our son to be generous and grateful all year long, there is a special emphasis in the months of November and December. As the leaves on D's thankful tree have been filled with mentions of rockets and space and NASA and Houston, we have been gently trying to think of other things, perhaps closer to home, for which he is thankful, like perhaps his mommy or daddy, or warm home, or good food to eat. 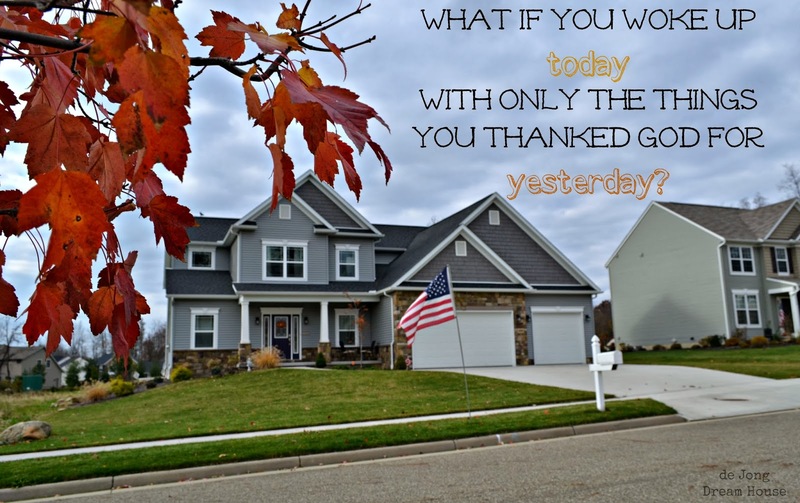 I love the challenging question, "What if you woke up today with only the things you thanked God for yesterday?" There are lots of printable versions of this question on Pinterest, most of them our words only. I liked the idea of giving D a visual reminder of how blessed we are so I made my own printable to kick off our third week of thanksgiving. I need to do this tree with my kiddos! Thanks for linking it up to Less Laundry, More Linking party!